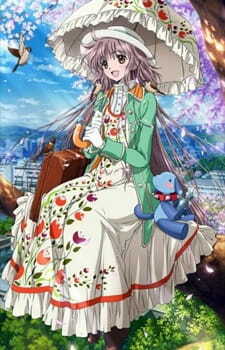 A romantic comedy anime featuring a peppy and naïve girl sent to Earth on a mission to collect 'konpeito' in a bottle by healing people's hearts. This starts off an interesting and uniquely funny story that will make an imprint in your mind. After watching this anime, I would safely conclude that this anime is probably more suited to girls than to guys. Why? Because it is so uniquely cute, peppy and innocent that it may not appeal to guys that much. There is little action and some slight touches on fantasy, but generally, the story is focussed on the girl and her mission to collect 'konpeito'. I must warn though, the story is a bit 'draggy' and slow at the start, but towards the end, things get interesting. Will she fill the bottle in time? What is her final wish? How does love overcome all obstacles? These questions just kept on pulling on my mind. In the end, the plot is revealed and we get the answers we need. The art was well done and of high quality. I can't say that it is superbly done, but is like your average anime. The characters were animated well, the backgrounds were beautiful as always and the texturing was perfect. I loved how this anime defies all reality into bringing moving stuffed toys and talking animals into the story. Sound was decent. Not particular impressive or annoying, just your standard voice acting roles. The main protagonist, Hanato Kobato, may get on your nerves a bit with her peppy voice, but you will get used to it. Ioryogi was funny as always with his dry humour and fiery tempers. Background music was appropriate and the theme songs were nice and complemented the anime. Moving on to characters, I loved the way that the anime expressed the naïve side of Kobato. It really suited the anime's overall purpose and theme to it. I am glad they did not change her personality or attitude until the very end of the series. As for the other characters, we all got to discover their background stories, their weaknesses and their hardships which led to Kobato healing them with whatever means possible. I did however, find a slight change of heart from Kobato throughout the anime. In the beginning, I felt Kobato was just finding people and trying to heal them without thinking, however, as time passed, I felt she actually showed compassion and willingness to help others without being selfish and in the end, getting rewarded. Oh and did I mentioned, some characters were referenced from Chobits! I was both shocked and suprised. After some research I discovered that both Kobato. and Chobits were by the same manga group. Whenever those characters pop up, I would hear myself repeatedly chanting, "Chobits! Chobits!". So I do recommend watching Chobits first then Kobato. to fully understand what I mean. In the end, I enjoyed the anime to an extent. In my opinion, this anime may not be suited for a guy to watch for many reasons. This is a girl-oriented anime that expresses feelings and conveys emotions that not many guys can fully comprehend. That said, I honestly found the first half of the series a bit of a drag. It may be so, but maybe not for other viewers. A slight drag at the start but gets interesting towards the end. Some really funny moments here and there. Not bad for a slice of life, fantasy and romantic comedy anime. Hanato Kobato's clothes do look cute as always. Your average anime with decent voice acting and nice theme songs. Nothing too impressive here. Some characters were annoying, some were funny, some were boring and some were nostalgic. If I was a girl, I probably would have liked it more. But hey, don't ask for the impossible. I liked it overall, although I probably won't be re-watching it. Its a nice and innocent anime to watch when you have lots of free time or just tired from too much action/adventure and just want to relax.